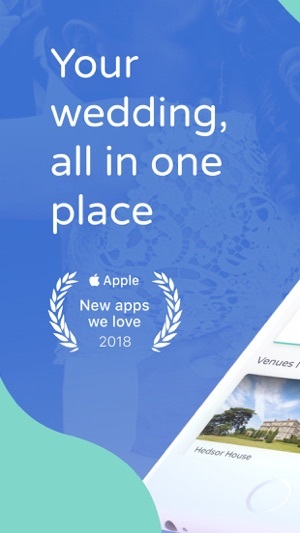 "The highest rated wedding app in the world" (The Telegraph). Get ready for the adventure of a lifetime with Bridebook! Congratulations on your engagement! Think of us as your very own, personal wedding planner that sits in your pocket, and doesn’t cost you a penny. 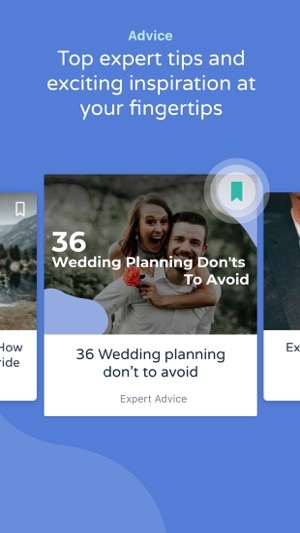 We quite literally have “everything you need to plan your dream wedding” (Brides Magazine), all in one handy app. So what are you waiting for! Let’s get stuck in. Search, contact and book your wedding venue and suppliers all in one place. 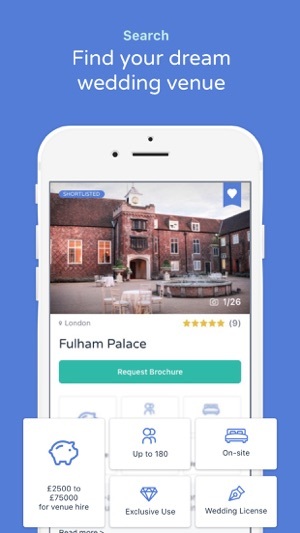 With features such as filtered search, shortlisting and reviews, our leading directory will help you build your dream team of wedding suppliers in no time. Set your anticipated wedding date and get your very own customisable wedding planning to-do list to guide you up until your big day. Follow your personalised timeline to see which tasks should be completed when. Planning a wedding has never been easier! With our personalised wedding budget tool, you’ll be able to easily break down your wedding costs and track your expenses. Find out how much you should be spending on venue, cake, dress, and all the rest. 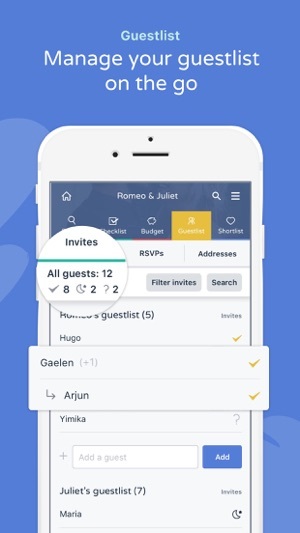 Whether you’re sorting who is allowed plus-ones, or you want your third cousin twice removed to only attend the evening festivities, our wedding guest list manager will make this potential headache as easy as saying ‘I do’. Track how many days are left until you get married! 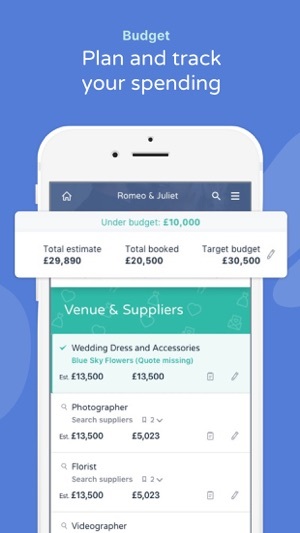 Save all your favourite wedding suppliers to your shortlist for seamless tracking - don’t forget to share with your fiance and wedding team for their input too! Feeling daunted by the prospect of wedding planning? With Bridebook you have nothing to worry about! We’ll provide you with the best tips and tricks to make your wedding planning complete. No matter what your wedding budget, Bridebook’s team of top notch wedding experts, from Bobbi Brown to Jenny Packham, will provide all the guidance, inspiration and ideas you need to plan your wedding to perfection. Find inspiration by searching through our hand picked selection of real weddings! Whether you are a bride or a groom, getting married is the most important moment of your life and we will help you every step... to the aisle! You can now add your partner (and friends) to plan your wedding together! Save notes, ideas and photos all in your Scrapbook. Update guests with just one click, add guests in bulk, and export your guestlist from mobile. More easily see, store and compare your favourite suppliers from our directory, and even add your own. I, like many other busy professional women I know wouldn’t have a clue on where to start with their wedding planning. Well, I am SO thrilled to have found Bridebook. Bridebook has it all from setting your budget, a mapped checklist (personal fave), and so many suppliers - even when searching in a remote location in Wales did Bridebook come up with many options of photographers, videographers, hairdressers, impressive. 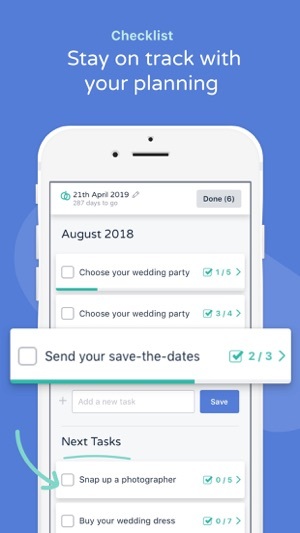 The desktop version is great to use but when you’re on the go this app is a lifeline into your wedding ensuring you’re keeping up-to-speed with guest list/RSVPs and with a nifty desktop downloadable Excel spreadsheet with all info - thanks! You don’t need to be tech-savvy to use Bridebook but I would say if you do take enjoyment from using tech in your daily life - then this app certainly won’t disappoint you as there are so many features and gizmos to it you will never be bored or discontented - and it’s free?! Keep up the good work 👍🏼I, like many other brides (to be) surely rely on your ingenuity and you truly make planning my wedding that much easier and dare I say it, fun too. For someone who usually finds a ‘but’ in anything positive and any little glitches with an app, all have to say this app is the best app I’ve ever downloaded! I’m not the most organised person and tend to avoid organising things that seem like a big job. This app does it all. It couldn’t be made more simple! There’s a section for everything. It’s all been covered. I’m sure wedding planners must be losing business since this apps. It’s completely free too so it’s not like you have anything to lose by downloading it. It’s suitable for iPhone and iPad so it can goes everywhere with you. 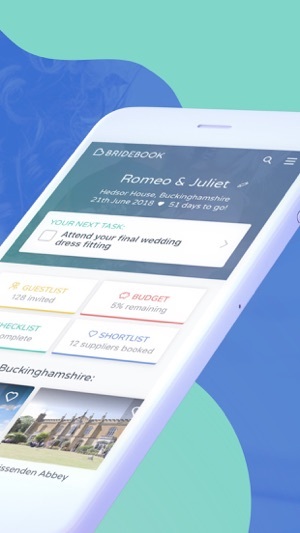 Bridebook is a great app, it could do with a change though. When editing a guest in the list it would be helpful if we didn’t have to scroll all the way back up to the beginning of the list to then have to scroll all the way back down again to edit another guest. Very inconvenient when you have a long list. It would be better if you are taken back to the same place in the list after clicking into a guest to make changes. With wedding location, the add a venue that’s not on the list feature doesn’t actually save the venue once adding. Otherwise this app is a great tool!